Cover illustration: A Naked Youth Seen from the Side, Perhaps Robert Blake, c. 1779-80 (Butlin 71). Reproduced by permission of the Trustees of the British Museum. Stephen C. Behrendt (University of Nebraska) is currently working on projects including women poets of the romantic period and romanticism and the British Radical press. Alma Bennett (Clemson University) will complete a book on the American novelist Mary Gordon this spring. D.W. Dörrbecker (University of Trier) is the author of Konvention und Innovation (1992), and his edition of Blake’s continental prophecies is to be published by Princeton this summer. Alexander S. Gourlay teaches English at the Rhode Island School of Design. 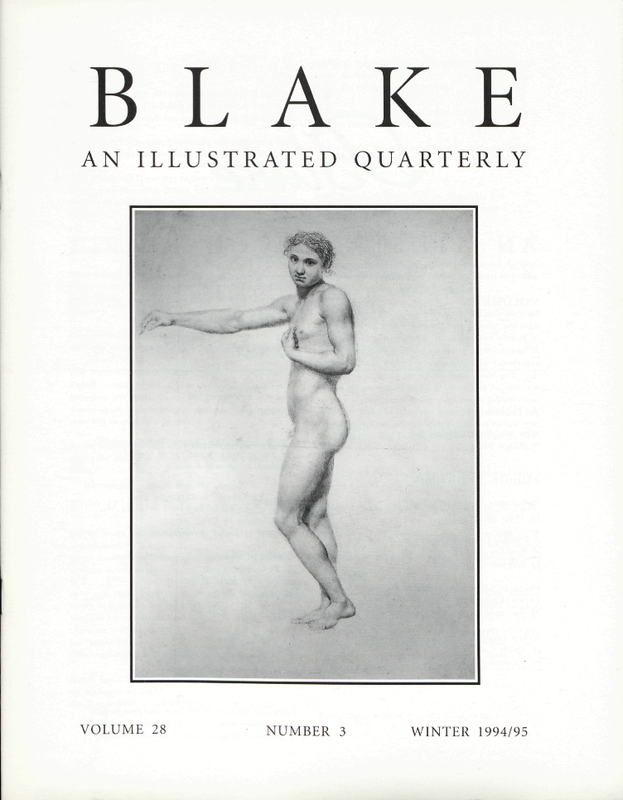 Mark Lussier (Arizona State University) has published essays on Blake in 1650-1850, Nineteenth-Century Contexts, Visible Language, New Orleans Review and Arts Quarterly. Ronald Paulson’s most recent book is the forthcoming The Beautiful, Novel, and Strange: Aesthetics and Heterodoxy. June Sturrock (Simon Fraser University) is working on Blake’s versions of the women characters of established narratives. Her book, “Heaven and Home”: Charlotte Yonge, Tractarianism, and the Nineteenth Century Women’s Movement will be published in 1995. Aileen Ward (New York University) is the author of John Keats: The Making of a Poet. She is writing a biography of Blake.